For a long while I have plans for a dedicated photo studio for taking pictures of painted miniatures. The most common solution for taking macro photographs is a lightbox. You can buy these out-of-the-box (this is a little fabric tent) or make one of your own with a cardboard box and some translucent paper. But the drawback (for me at least) is that it takes up some room and you need at least two decent lights to get good results. 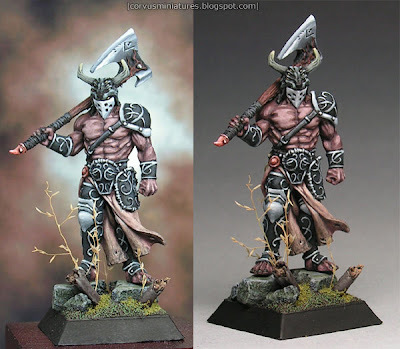 But last week I got an idea for a compact photo studio after seeing this picture on the Mantic Games website: it actually features walls with aluminum foil to reflect and disperse the light. So I used a cardboard box, cut out one side and the top and the bottom, and used some tape to cover it with aluminum foil. I also put some foil on the floor of the small studio. It's easy to fold up and store flat somewhere. I'm also testing out a new backdrop I have created instead of the usual gray gradient... I think the sepia one looks best, what do you think? Oh yeah: I will be offering these backgrounds to download soon. I created them myself in Photoshop. Here's a comparison with my previous photo setup. I think it's really a big difference. 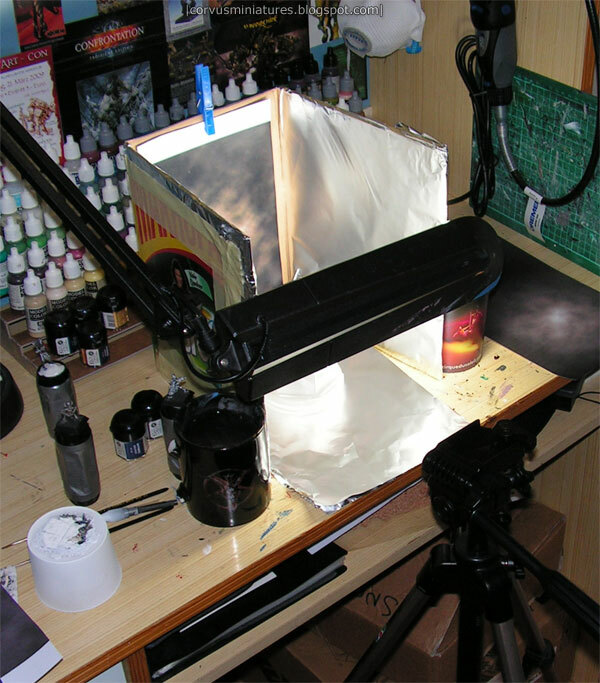 When I have enough room and the cash to buy some decent daylight lamps I will most probably build myself a big lightbox studio, but right now I think this is a great alternative. And I'm really happy about my new backdrops as wel. Simply excellent mate, I'll be giving this a go. Thanks very much for sharing, great article - I will put it to good use. I think the sepia probably looks better too. 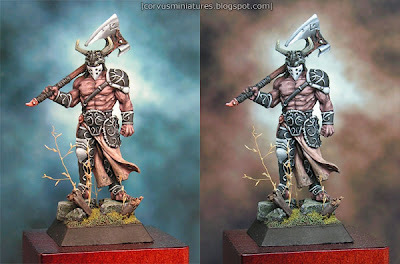 I'd like to feature your article on my new Warhammer Miniatures Gallery blog (http://whfm.blogspot.com for all things miniature related which are inspiring). Would it be ok to copy some of your pics here ? Hrm. What an interesting idea... I'm going to try this out and see how it goes. Cheers and thanks! @Sigmar: sure no problem. As long as you put up a link to my blog and leave the watermark on the pictures untouched, that would be great! Building one this evening ... genius! Hey Gerrie! Is this the same mini on both pictures: http://4.bp.blogspot.com/_pyfuAuhu_jQ/S7-WyqjA-aI/AAAAAAAAAyM/8DakojwzihI/s1600/20100409-photostudio-b.jpg ? The hue/tone(?) appear different depending on backdrop? yes it's the same figure... camera is set to automatic so I don't know what caused the different appearance. Just a quick question: do you use the matt finished side of the alu-foil or the 'polished' one? Thank you, works fine and great idea! BTW, I love your site so I've added it to the WFB Allies blogroll. Please consider reciprocating. Thanks again and all the best with the Hammering and blogging !